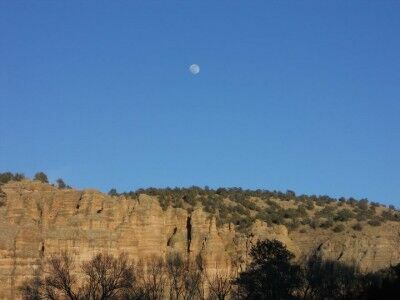 As I was driving in to see the Gila Cliff Dwellings National Monument (about 1 mile from where the Gila Cliff Dwellings are located), I noticed that the moon was reflecting brightly in the daytime sky and I managed to get this shot of it. I wish I were a better photographer because even though I like this photo, it doesn’t do justice to actually being there. It’s always exciting when I come across these beautiful scenes that stop me in my tracks.